Just as we were all relaxing after the last cull, the usual suspects are calling for an increase in cull numbers of boar. 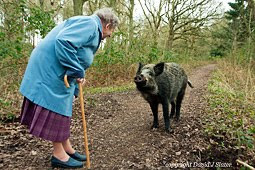 After a successful year-long period of no hunting between September 2011 to September 2012, the Forestry Commission decided to vetoe the Boar Scrutiny Meeting's findings and went all-out to secure a bag of 100 boar for themselves. This has been outlined previously, but in essence the Forestry Commission came to an agreement with Friends of the Boar, Martin Goulding and the Verderer Ian Standing to continue the closed season until a new census had been undertaken. It was remarked at that meeting that over the year long peace, boar sightings were down, as were complaints and even the boar diggings. Waiting a few more months for a better census to be undertaken seemed appropriate. But the day after the meeting, the Forestry Commission went ahead with a cull of 100 animals between September 2012 and January 2013 with no such census. We had just witnessed a very peaceful forest with little diggings from the boar. On exactly the 1st September 2012, hunting began and boar instantaneously came back into villages and began to dig at the roadside verges again. This is precisely what Friends of the Boar had predicted would happen and we were right. it is now a pattern of behaviour that we cannot ignore. We warned of more problems if another cull were to take place, and of course it did. From September 2012 until early March 2013, roadside diggings and digging at picnic sites resumed. 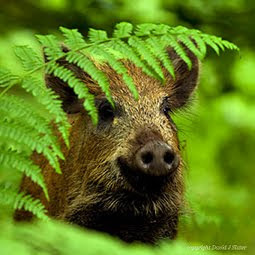 The Forestry Commission killed 78 boar plus another 25 boar killed by other non-speciefied means in the space of 5 months. If our estimates of population were correct this amounted to a 50% loss of boar. The prolonged cold spell plus the diminishing extent of suitable shelter due to tree felling has resulted in many sows losing theor piglets or aborting them. The culling halted in January 2013. What happened next was a repeat of the aftermath of the last cull. Diggings at roadsides continued for 2 months and then stopped. It is now difficult to see a boar or new roadside / village diggings. What is so frustrating in our fight to stop the needless and unscientific culling is the severe lack of knowledge about the boar. This lack of knowledge underpins the calls for culling based upon nothing other than opinions about road diggings. Here is some facts about road diggings. It takes only 1 adult boar to dig up many square metres of soil in one night. If the digging is along a road a single boar may have dug along 5 miles or more of verge, possibly more. If this happens in the winter months when the grass is not growing, the exposed soil remains for maybe 4 or 5 months. The nightly addition of diggings over the winter months can result in what seems to be total destruction of some road verges. The fact is that this digging could be the reselt of very few boar. By the end of the winter after many frosts and much rainfall, the diggings have slumped into small mounds and eventually the grass will begin to grow back through. In the next month or so, by late April or May, the roadside will once again be verdant with new grass growth and hopefully new flowers hitherto dormant in the compacted and neglected roadsides and woodland rides. Ignorance is the greatest weapon against the boar. The Forestry Commission are actively promoting press attention at the moment here, reeling off their usual mantra of populations doubling (it used to be a trebling) and an inflated population estimate of 600 boar or more, based upon no evidence whatsoever. Yes, the Forestry Commission undertook a secret night census recently (March 2013), claiming to find 30 boar in one night. Friends of the Boar did the same, in the very same area, and found just 7 boar. 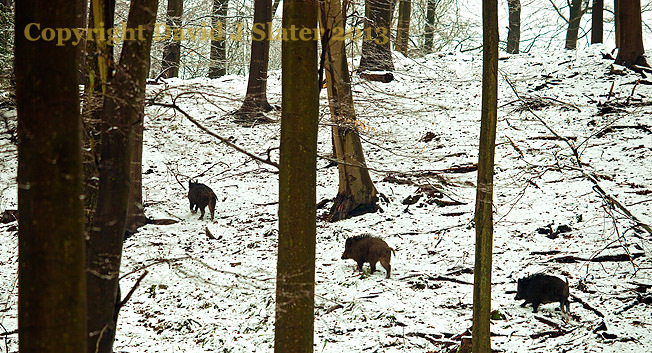 That is, 7 boar in an area of 2 square kilometres. This area is known to be a hot spot for boar due to its quality of shelter for the boar. What we are confident of is that we did not count the same boar more than once! It was undertaken during the time that many sows were having piglets and so this figure is a maximum and not some average. Maybe by extrapolation, the Forestry Commission are happy to decieve the public once again by stating half-truths about doubling numbers, but we are not. There is no need for a cull. 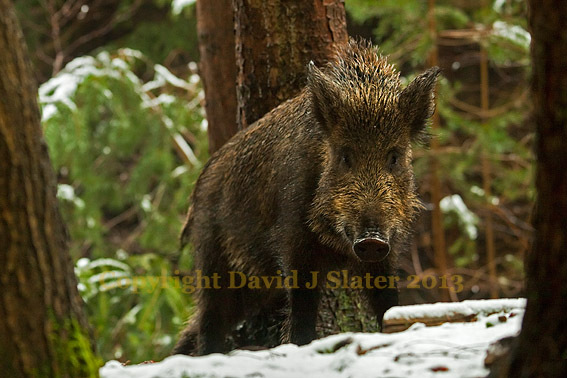 There is no evidence of booming numbers and no evidence the boar are affecting other animals. We will provide this proof when appropriate. Sow having a scratch in the snow, March 2013. This mature sow had no signs of having had piglets. As an aside, it was amusing to read in a local rag today (11th April 2013) that many people are in support of an increase boar cull because of the mess the boar make. In the same issue was a story of a lady having to be rescued by the Fire Service after she became stuck up to her thighs in the mud left behind by Forestry Commission operations! How so very true. The Forest of Dean is currently in a digraceful state thanks to tree felling - and from what we can see this is NOT felling to combat Ash dieback or Larch infection, but felling of healthy oak and spruce. There is an urgent need to highlight the hypocrisy.